Personal development projects can be a pain to get going. I’ll usually feel motivated at the start, possibly due to watching inspiring videos on YouTube (Will Smith gives some of my favourite pep talks). I’ll buzz with energy and optimism, walking around with pen and paper in hand. Woah! Steady on there. I’m going to start a new job, study for a project management qualification in the evenings and then spend my weekend on Codeacademy?? Even if I did manage to find space in my calendar for this blockbuster schedule, I’d quickly feel overwhelmed. And each time I’ve tried this approach, I have indeed given up. That’s right. I recommend that you focus on just one goal at a time. Start small and change your approach as you learn more. You’ll learn from your mistakes and gain knowledge of how to best complete your project. Do a little every day. Set and complete a small task every day which contributes to your goal. Write down your daily progress. A personal example — with Azendoo! I started my career in sales and marketing in 2017. I spent a lot of time writing emails to potential customers. I took this as an opportunity to practice and improve my copywriting (writing to sell) ability. So, for a couple of months, my only personal development goal was to improve my copywriting skills. Once you’ve set your goal, then Azendoo starts to come in very handy — it will act as a fantastic central hub for all of your project notes, tasks and files. You can set up what is called a ‘Project’ in Azendoo, to act as your hub. You can make this confidential from your colleagues if you wish. Write an attention-grabbing subject line. This will improve the number of recipients who open your emails. Use a clear and concise writing style. You want to make it easy for the recipient to understand the purpose of your email. Come up with a compelling call-to-action. 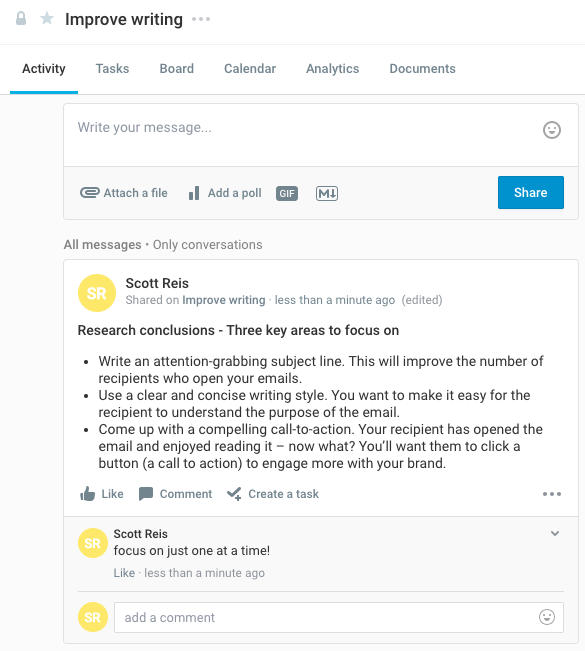 Your recipient has opened the email and enjoyed reading it — now what? You’ll want them to take an action to engage more with your brand. As you can see below, Azendoo helped me to create a clear record of my research, which I was easily able to find and search through when I needed to refer back to something. I chose just one of the ‘skill chunks’ to focus on initially — specifically, the ability to ‘write an attention-grabbing subject line’. Each day, I would wake up and set myself a new task, then mark it as complete when done. And then another task for the next day. As you can see in the screenshot below, these were not huge tasks. But, they built momentum and I gained a feeling of progress. 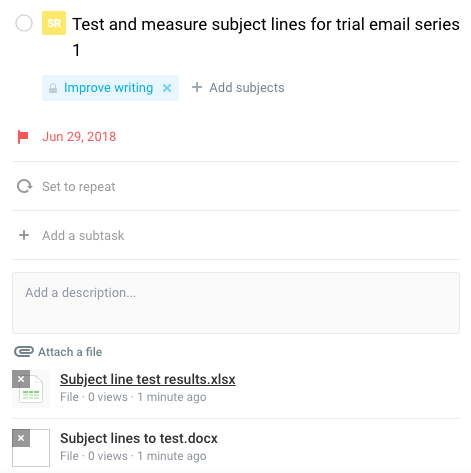 Azendoo tasks have a neat feature where you can attach files, including evidence of your work. 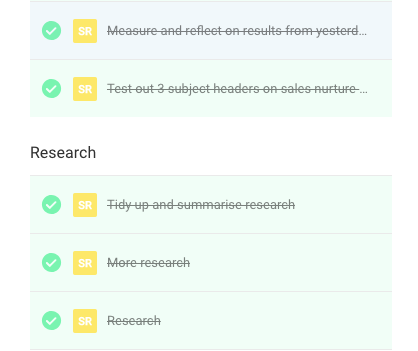 You can see below that I’ve attached subject line tests and their results to the task, ‘Test and measure subject lines for trial email series 1’. Why is this useful? Well, when you’re next applying for a job and you need to write about your achievements — then your record-keeping in Azendoo will make your application a lot easier to write. I kept doing my daily tasks, and little by little, I made progress! You can keep a record of your tasks in Azendoo. And view them in list form (as below). 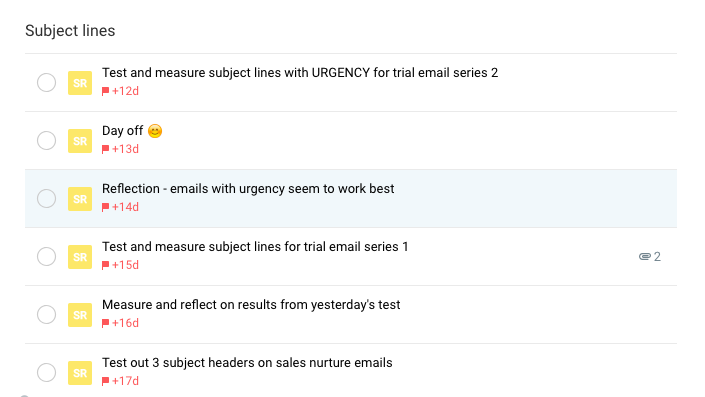 You’ll notice that I commented on 30 June that I’d learnt that email subject lines with urgency were performing best. So, on 2 July, I began to focus on inserting urgency into my subject line tests. By writing down your daily activity, you’re forced to reflect on your progress and ask yourself, ‘am I reaching my goal?’. And if not, you can change your approach easily. Sometimes I think that all it takes to turn an OK day into a productive one is to just… start. With a small, simple task. 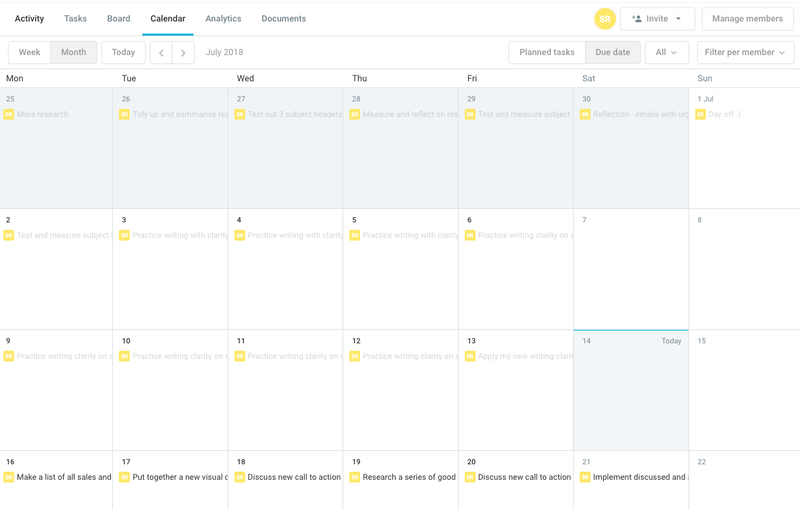 You can use this approach, combined with Azendoo, to start to see small, cumulative improvements each day in your personal development project. And in the longer term, you’ll see that lots of small improvements = one big improvement! Keep it focused. Achieve one goal at a time. Start small and improve as you go. Do a small task every day. Keep a daily log of your tasks. And when you want to sit back and admire the progress you’ve made, you can switch to Azendoo’s calendar view.